The State of Nevada now has its first wind farm, Pattern Energy's 150 MW Spring Valley wind project, which has won an award for the use of Virtual Design and Construction technology to overcome the challenges of building on environmentally protected lands. When it comes to wind power, Nevada is not the first state that comes to mind, but it recently saw the start of operation of its first wind farm, Pattern Energy Group LP's 150 MW Spring Valley project—and there could be more wind power to come. According to the National Renewable Energy Lab, Nevada has wind resources of more than 7,200 MW, meaning there is the potential for wind power to provide a large share of the state's power needs in the future. Pattern Energy Group CEO Mike Garland says the company knew Nevada had good wind resources and had been looking to do a wind project there for several years; it was a matter of lining up the right site and gathering support from a number of different groups and government bodies. "Spring Valley Wind came about after a long effort looking in Nevada," he said. "The state has reasonable wind resources, but a number of the locations we had looked at would have been very difficult in terms of construction, including some high elevation sites." The 7,700 acre site on federal land in west central Nevada (near the state line with Utah) has proven to be a winner. As its name indicates, the project is in Spring Valley, which runs north-south for about 110 miles between the Schell Creek and Snake mountain ranges in eastern Nevada. "Wind power is really a natural for Nevada," explains Garland. "The state has solar and geothermal resources which are being developed, and it really was just a matter of time before wind would be generating power in Nevada." A key element for the Spring Valley project was that utility NV Energy was already working to de-velop a new north-south transmission line. NV Energy co-developed the One Nevada transmission line (ON Line) with New York energy developer, LS Power. The 235-mile line connects Nevada's northern and southern power grids and transmits renewable power from rural areas, where it is generated, to urban markets. NV Energy owns 25 percent of the line, which will be delivering power from the Spring Valley project in the near future. Pattern has a 20-year power purchase agreement with NV Energy for the sale of energy produced by Spring Valley. The Spring Valley project also received non-partisan political support from Democratic Senator Harry Reid and Republican Senator Dean Heller. "There are also a large number of people within Nevada who strongly support renewable energy," adds Garland. Just as important, the project also had good support from the nearby town of Ely. "That community support means a lot to us," says Garland. Also supporting Spring Valley Wind was Ken Salazar (until recently the U.S. Secretary of the Interior). This was crucial since the entire project was built on Bureau of Land Management land, which falls under the jurisdiction of the Interior Department. Pattern Energy has done a number of wind projects on private land. Do they find developing projects on public land more demanding? "Absolutely," says Garland. "It's always more comprehensive. In some ways, you usually do the same amount of work, but things are usually more expedited with private land. "The BLM was very supportive of doing the Spring Valley project cooperatively, but since it is public land, they have more procedures and requirements. They were tremendously supportive, and they wanted something to happen if we could do it right. But they held our feet to the fire, making sure we did it right and were responsive to the community." Part of the planning and approvals process included extensive environmental studies on the part of Pattern Energy. The company put in a substantial amount of effort to mitigate, as best they could, any potential impacts of the project, says Garland. One of the concerns on the project site was pygmy rabbits. As their name suggests, they are small—you can easily hold a pygmy rabbit in the palm of your hand. They are difficult to see, but Garland says whenever a construction crew spotted one, they stopped or re-directed construction. Bats that live in caves in the mountains near the wind farm site were also a concern. "People were concerned that the bats might fly out directly into the wind project site, but for the most part, they fly out of the caves and go south toward farm lands, looking for bugs to eat," says Garland. Pattern Energy installed a monitoring system from Florida-based DeTect Inc. that tracks the bats. "We've only had a limited time to see the results, but so far they've been positive, in that we have not seen a lot of bat fatalities." 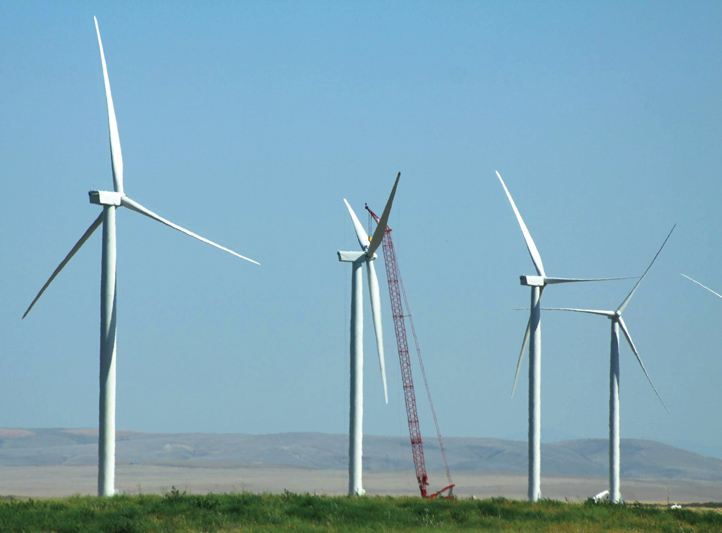 Carrying out construction on the project was veteran wind farm construction firm, Mortenson Construction. The planning and approvals process for the Spring Valley wind project included extensive environmental studies on the part of Pattern Energy. The company put in a substantial amount of effort to mitigate any potential impacts of the project. Pattern Energy has worked with Mortenson on a number of wind projects, and they bring to the table what the company is looking for in a construction partner, said Garland. "We want high quality work, and we need to have people who can work with us to keep costs within budget and the project on schedule. That does not mean you won't come across problems and need to make adjustments—we find that the best contractors are the ones who will work with our construction management team and come up with good ideas and solutions on how to get around a problem or do something better. "Our construction management team has done 30 projects now, so they know how to communicate with contractors, and they find the best ones look for solutions, quick decisions, and a reasonable compromise." Garland added that critical thinking and good problem solving skills are a must for a contractor. "They need to be able to deal with unforeseen things and figure out a way forward. There are people who do that well, and people who do that poorly—and that applies to both the construction side and the development side." Garland believes there may be some naiveté in the general construction world when it comes to looking at building wind projects. "On the one hand, wind farms are pretty straightforward to construct—you build road, you build the foundations, you put in the distribution/collection system, you put the tower up, the nacelle up, wire it up—and you're done. "But the business has become very demanding; people are expecting 98 percent availability from wind turbines." To hit that availability mark, the project needs to be built right. "For example, if you have a distribution system that includes splicing in the ground that is shorting out, you can cause lower availability. It's the smaller things that make a difference between a project working well, and it not working well." Getting it done right at the construction stage by a well-qualified contractor is clearly key to a project working well, he says. "We're relationship oriented, and we go back to the people who deliver for us. But we also want them to look at how we can save money or new approaches." Sera Maloney of Mortenson was able to do the latter on the Spring Creek project. Maloney was named a winner of the Be Inspired Awards in the Innovation in Land Development, Engineering, and Management category. Sponsored by Bentley Systems, the Be Inspired Awards recognize outstanding infrastructure projects. The projects are submitted by Bentley's software users and judged by a jury of independent experts who select finalists that exemplify innovation, superior vision, and an unwavering commitment to exceptional quality and productivity. Mortenson's award submission was based on their ability to effectively use Virtual Design and Construction (VDC) technology to overcome the challenges of building on the BLM's environmentally protected lands, for the Spring Valley project. Mortenson modeled each stage of construction to optimize the layout of turbine parts and equipment. Reducing the project footprint by nearly 40 percent per turbine site, it significantly minimized the cultural, historical, and biological impact of construction. VDC is a process used to enhance collaboration, reduce time and cost, and foresee project constraints before they occur. The process uses a CAD created model—typically created in 3D—to virtually build the project before construction begins. Mortenson is said to be one of the few renewable energy contractors using VDC as a standard pre-planning component in the preconstruction process. Siemens, which supplied 66 of its 2.3 MW turbines for Spring Creek, is one of a select group of turbine suppliers that Pattern Energy works with. Just because Pattern Energy has worked on a large number of wind projects, does not mean they want a large variety of wind turbines, says Garland. "We like the fleet concept, especially as one of the things we are going to be doing going forward is upgrades. You can do that incrementally, and in a smart way, if you have some common equipment. You can make innovations on some turbines, see how they work, and then make those changes across the fleet. But if you have different equipment and manufacturers, it may work for one piece of equipment in one location, and then you may have to come up with another unique solution for another site." Siemens, which supplied 66 of its 2.3 MW turbines for Spring Creek, is one of a select group of turbine suppliers that Pattern Energy works with. 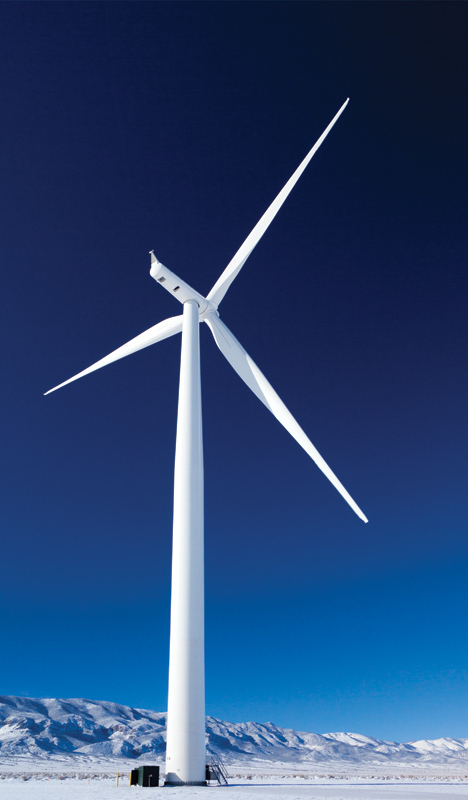 Pattern Energy likes the fleet concept toward turbines, as this approach facilitates upgrades in the future. Essentially, working with a smaller group of turbine suppliers gives them leverage. "We have enough concentration with the equipment vendors that we deal with that they pay attention to us." Since they were working on public land, Pattern Energy was dealing with all three levels of government—federal, state, and county, right through the project. Garland said there is no real secret to dealing with government bodies and agencies in an effective way. "It's been said before, but it really comes down to the old adage: early and often communication and consultation. The most important thing is communicating openly and directly so people understand what you are doing. It's important that if they have concerns, they feel they can openly raise them with you—and that you will listen and be thoughtful in your response. "That does not mean you can always do what they are asking you to do—but if you are listening, and there is communication, you can usually work through issues." In addition to working with the BLM, they also dealt with the U.S. Fish and Wildlife Service, the Nevada Department of Wildlife, local Indian tribes, and the Sierra Club. Garland added that communications can be done in a number of ways, including through web sites, but nothing beats personal involvement and face-to-face meetings in a community, such as Ely, or with government representatives. Ely is a mining town and has seen its share of booms and busts over the years. In meetings with community leaders and residents, Pattern Energy stressed that they are committed to the wind project for the long term, with the 20-year contract. "They know that they can depend on this to be a baseline for the next 20 years, that the wind project is going to be a stable source of economic value to the community," noted Garland. There were the tangible benefits during construction of the $225 million project, with many local economic spinoffs. In addition, Spring Valley is expected to generate more than $20 million in tax revenue for White Pine County and the state of Nevada's Renewable Energy Fund over the next 20 years. With the Spring Valley wind project complete, Pattern Energy is looking for 2013 to be a fairly busy year, mostly due to the extension of the Production Tax Credit and Investment Tax Credit. With the uncertainty over whether it was going to be extended, planning was difficult. Garland said Pattern Energy had to take some calculated risks and have some projects essentially shovel ready, to take advantage of the Investment Tax Credit. "If you don't have a project pretty much ready to go, a one-year extension does not do you that much good. We have a few like that and will be pursuing them this year." In general, the uncertainty around the PTC and the ITC had left the wind industry in a bit of limbo toward the end of 2012. "We were hopeful there was going to be an extension, but no one was sure," says Garland. "And that uncertainty causes real issues with what you can fund—in particular bidding, offtake arrangements, and interconnection can take a lot of money. I think the industry was apprehensive about continuing to put more money into projects without an understanding of what was happening with the PTC." While he welcomed the extension, Garland said the U.S. government needs to look at changing tax policy to best provide incentives for the wind power industry, long term. If that's not there, the extension needs to be beyond one year, he says. "For us, it's important to have some resolution for the longer term happen sometime this year. And that is especially so for the manufacturers. A one-year extension does not give the supply chain any predictability at all. "I really think we're in an awkward place right now, where damage could be done to the manufacturing industry in the U.S. We've made these huge strides of going from 20 percent domestic content for wind projects to 65 or 70 percent—and that is a huge accomplishment. "But there is a good chance that in a year's time, we are going to be in a situation that when we go to order equipment, it might have to be supplied from overseas. That would be tragic for the U.S."
He added that the situation is certainly fixable, with attention from Congress on a further extension, or the ideal scenario, with the right tax policy changes.